30 X 10 Stamped Steel Baseboard Return - White Discounts Apply ! Baseboard return grilles feature fins that are spaced 1/3" with a 20 degree angle. 30 x 10 air vents are crafted of galvanized steel for strength and rust resistance. This baseboard return grille has a white enamel topcoat. These air vents work well in existing homes and new construction. These baseboard return grilles are a great compliment to baseboard registers. 30 x 10 Air vents are quality made returns and affordably priced. ***Hint: The industry standard is to order baseboard return grilles using the actual hole opening size and not the faceplate size. 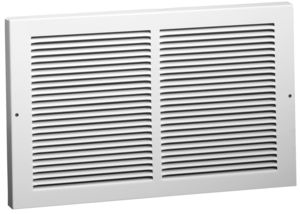 This metal return air grille will fit a 30 x 10 inch hole opening. Actual Faceplate Dimensions (LxH): 31 3/4 x 11 3/4 inches. Baseboard return grilles can be purchased in more sizes and finishes. Air vents looking dingy and dinged up? Place your order today for these new white ones!